When Riverwise Augur enters the battlefield, draw three cards, then put two from your hand on top of your library in any order. Crystal Ball is the most obvious replacement for Sensei's Divining Top . Descendant of Soramaro can work, but it's slow. It will die to Lightning Bolt if you don't have at least a few cards in hand and 2 mana open after casting it. Eldrazi Displacer , and any card with an ETB scry ability like Sage of Epityr , Augury Owl or Riverwise Augur . Leyline of Anticipation obviously works with any sorcery-speed scry like Mystic Speculation . 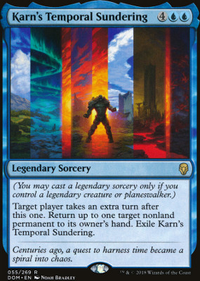 Doom Whisperer seems like the most promising: with Counterbalance in play, it would be almost impossible to deal with; you could just pay life to surveil until you find what you need. 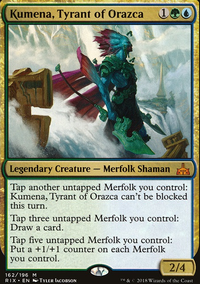 Thrun, the Last Troll has lost a lot of luster against UW in my opinion. Terminus and Settle the Wreckage are both clean ways to get around Hexproof and regenerate, it feels so good to resolve against Cryptic Command mana, but he doesn't seal the opponent's fate on the spot anymore. I prefer Obstinate Baloth as another generic threat against aggro decks, black midrange decks and Burning Inquiry decks. It also still supplements the post board Tireless Tracker midrange plan. A more janky suggestion is if you're considering Jace, the Mind Sculptor to tuck your pod targets back in the deck, Riverwise Augur is much lower power level, but it is poddable. I don't know how often this would come up, I would personally say either aren't worth it. Interesting list, but there are cards that stand out as, not so good. 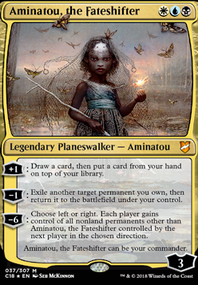 Your curve is an upside down bell, maybe try cutting the four 6cmc+ cards and leave Teferi as the top end? Riverwise Augur fills in your empty 4 drop spot, gives you extremely powerful card selection on a body, and also sticks around as a future flicker target. Unbreakable Formation is a sideboard card. 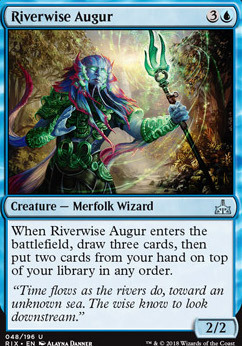 Riverwise Augur can be replaced with better cards like Wayfinder and Impulse that cost less. 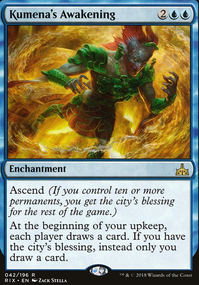 In Modern, there is not a card that lets you put your whole hand on top of your library, but there are a couple cards that allow you to put a one or more cards from your hand on top of your library. Most of these, however, are not competitively viable. 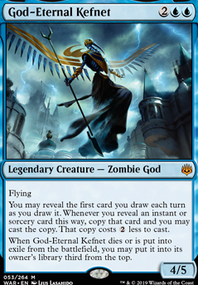 Far and away, the best such card is Jace, the Mind Sculptor. However, it justifiably comes with a large pricetag. Your remaining options in Modern are rather mediocre. Enter the Infinite, which is both too difficult to cast and will leave you with an empty library at the end of your upkeep, causing you to loose on your draw step. Leashling, which is too difficult to cast in Modern. Riverwise Augur costs a bit too much for the effect. -Survivor of the Unseen is repeatable, but that cumulative upkeep is going to become repressive quickly. 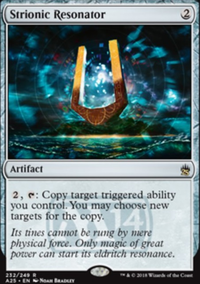 I know it's wrong, but Reforge the Soul doesn't really play nice with the other miracles, maybe run Riverwise Augur to put game winning miracles on top. Telling Time is decent with miracles.